Garden State Park in flames during the 1977 fire that burned it to the ground. Photo by Deer Park Fire Company, Cherry Hill, NJ. Garden State Park was the first New Jersey racetrack to be licensed after the state legalized pari-mutuel wagering in 1939, nearly 50 years after the sport had been banned. 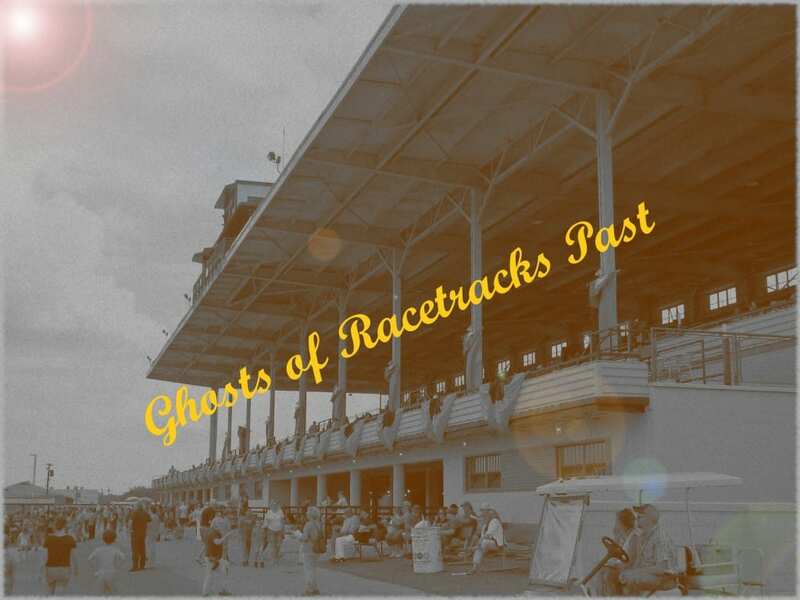 It became the setting for great horses and great races, but was also the first to close its doors, primarily due to economic distress. The Cherry Hill landmark was one-third of the “Golden Triangle” during the glory days of New Jersey racing, sharing the season with Monmouth Park in Oceanport and Atlantic City Race Course outside of AC. Its story begins in 1941, when the Eugene Mori, a Vineland native and self-made millionaire the New York Times described as having the personality of a “paternalistic choirmaster,” gathered a group of his well-heeled friends and applied for a license. The State Racing Commission informed Mori they would approve his application if he returned in 30 days with a certified check for $1.2 million. Without blinking an eye at the astronomical sum, Mori raised the funds in three days through a combination of seed money from his friends and money he raised going door-to-door in Vineland, selling stock in the new racetrack. Mori’s business smarts helped make the Garden grow. And his track record of turning a profit at other ventures gave investors confidence: he developed the largest bank in Vineland, and wore hats as a financier, automobile dealer, theater operator, contractor, a real estate tycoon with acquisitions as far away as California and Florida, and a director of one of the nation’s largest frozen food corporations. But Mori faced one big obstacle in building his new racetrack in Camden County – World War II. Groundbreaking commenced in November, 1941, and quick progress was made on the grandstand, which was designed to hold more than 30,000 people, as well as the stable area. Construction stalled, however, when the Japanese bombed Pearl Harbor on December 7, and the United States entered World War II the next day. The War Production Board said that all nonessential construction had to be completed by June 6 or be stopped until after the war was over. A shortage of materials resulted from restrictions placed on supplies required by the war effort, which forced Mori to replace unavailable steel with wood throughout much of the track. The racetrack was built with California redwood and brick and some steel from New York City’s recently dismantled Third Avenue El (elevated train). On June 6, 1942, Garden State Park opened for business. The first race was run at 2:30 p.m., and official attendance, despite rainy weather, was 31,682. The crowd bet $569,341 on eight races. The first horse to cross the finish line, a maiden 2-year-old filly named Spanish Sun, paid $10.50 to win in the 5-½ furlong race with a purse of $1,000. By 1944, Garden State had moved into the big leagues of racing, as total attendance soared to 674,670 for the 50-day meet, a daily average of 13,493 patrons, while by 1946 daily average attendance increased to 17,251. A big crowd at Garden State Park during the heyday of the Golden Triangle of New Jersey racing. Photo courtesy of Linda Dougherty. 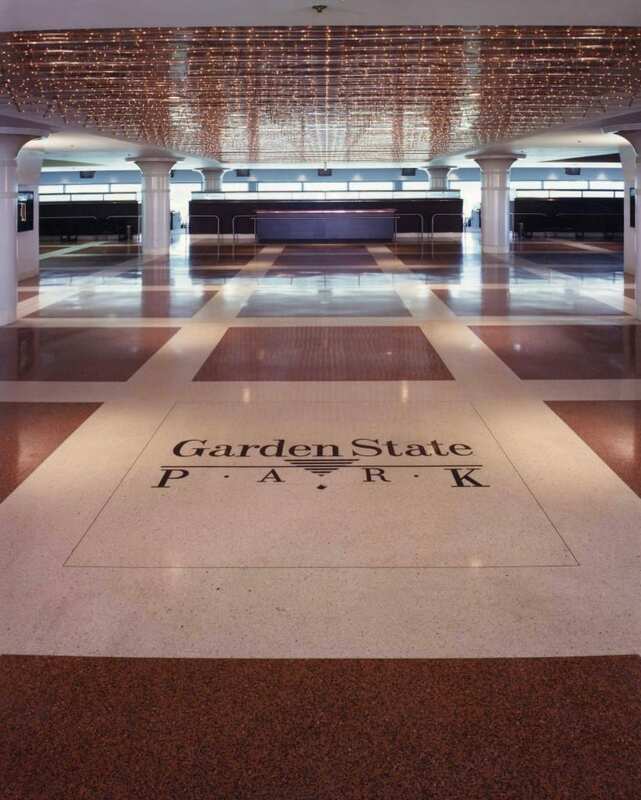 Thanks to Mori’s creativity, Garden State was able to attract some of the nation’s finest horses. Right from the start, the 1942 Trenton Handicap lured one of the biggest stars of the day, Calumet Farm’s Whirlaway, who had captured the Triple Crown the year before. Carrying 130 pounds and jockey Wendell Eads, Whirlaway won the 1-⅛ mile Trenton ‘Cap by a length over George D. Widener’s Rosetown, in front of a crowd of 18,492, which included the New Jersey native comedians Abbott and Costello. “They draped a blanket of violet asters over the long-tailed chestnut colt today at Garden State Park, for Whirlaway did what was expected of him in the $10,000-added Trenton Handicap,” wrote Louis Effrat in The New York Times on August 30, 1942. Six years later, on May 29, 1948, another Calumet Farm colorbearer raced over the Garden soil. Kentucky Derby and Preakness Stakes winner Citation came to town to compete in the $50,000 added Jersey Stakes, a stopover just prior to the colt capturing the Belmont Stakes and the Triple Crown. And boy, did he win big. “Big Cy” captured the 1-¼ mile Jersey Stakes by 10 lengths, setting a track record of 2:03, to boot. 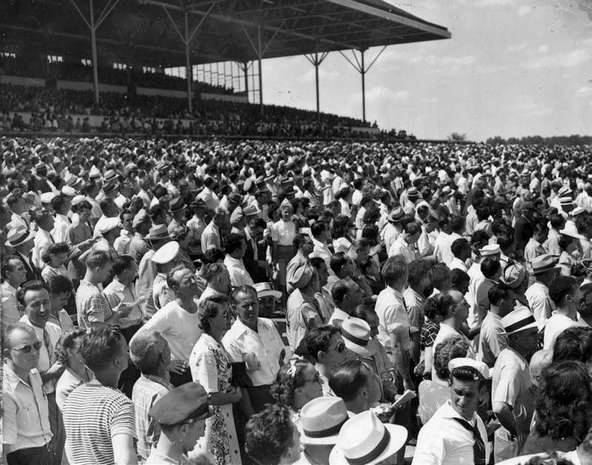 Joseph C. Nichols, sportswriter for The New York Times, commented that “Citation did it so easily that he didn’t appear to be in a race at all.” The crowd that day was 27,814. Fast forward to 1971 and 1972. Meadow Stable stars Riva Ridge and Secretariat both captured the Garden State Stakes, then an important test for 2-year-olds. They each used the race as part of their juvenile foundations towards victories the following May in the Kentucky Derby. “I’ll be at Garden State Park as long as I’m alive,” said Mori in 1973. But he passed away, at age 77, in 1975 and did not live to see what eventually became of his showplace on Haddonfield Road. 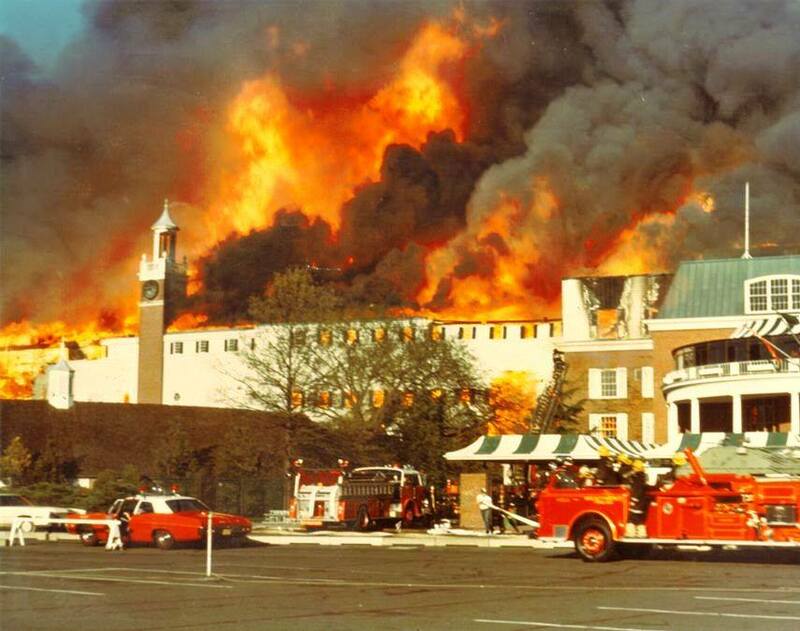 An inferno, the biggest in Cherry Hill history and one of the largest ever in the state, destroyed the track on April 14, 1977, and was believed to have started in the ceiling of a second-floor dining facility. About 11,000 spectators were inside the grandstand and clubhouse at the time the fire began. When the conflagration was finally extinguished, Garden State Park had been destroyed. Two people died in the flames, and a fire police captain suffered a fatal heart attack while driving to the scene. The reborn Garden State Park. Photo by Linda Dougherty. What remained of Garden State Park was sold for $15.5 million in December, 1982 to Robert Brennan, a flamboyant financier who had grand plans for the property. Brennan was a familiar face to New Jersey residents, as he was featured in radio and television commercials hawking his First Jersey Securities, a penny stock brokerage firm. Brennan constructed a grand facility, a glittering metal and glass structure dubbed “The Taj Mahal of Racing,” costing somewhere between $130 and $165 million. Brennan added lights around the racing oval for night racing, and for the first time requested dates for harness racing. As time would tell, the new Garden would never achieve the popularity or financial success as the old Garden. On April 1, 1985, after an eight-year hiatus, the gates opened for the first race at the rebuilt Garden State Park, with a crowd of 27,053 in attendance. The high point of the new Garden era was the 1985 Jersey Derby. Brennan lured Kentucky Derby winner Spend a Buck away from the Preakness Stakes with an amazing $2.6 million bonus for any horse that could win the Kentucky Derby and three races at Garden State concluding with the Jersey Derby. When Dennis Diaz, the owner of Spend A Buck, accepted Brennan’s challenge and bypassed the Preakness, it sent the established racing world into a frenzy. It didn’t take long for Garden State Park to start sounding its death rattle. Despite the advent of full-card simulcasting in 1983, the Garden was engaged in a suicidal, head-to-head battle against Philadelphia Park, just a short drive away in Bucks County, Pa., for horses and patrons. It was clear that Spend A Buck’s run for all that money was going to be the track’s signature moment. On May 3, 2001, 2,000 fans came to see the last racing program at Garden State Park. That same year, Brennan was convicted of money laundering and bankruptcy fraud as part of his penny stock scheme, and was sentenced to nine years in prison. On October 30, 2003, the grand finale took place. 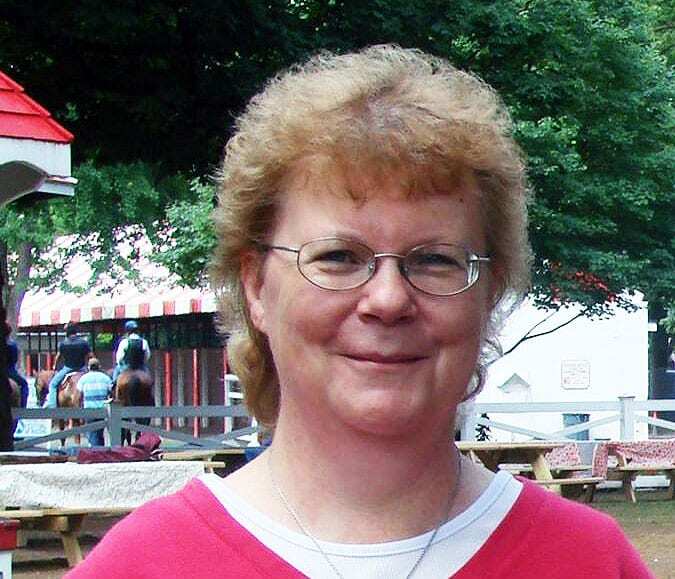 Linda Dougherty has been writing about horse racing since 1990 for publications such as Daily Racing Form, The Blood-Horse and Mid-Atlantic Thoroughbred. Follow her on Twitter @PaThoroughbred. There is no chance that full-card simulcasting had anything to do with “1983”. LOL – we weren’t even betting on the Kentucky Derby then. A racing journalist should get this right. You are correct. Full card simulcasting was illegal in the Garden State in 1983 (and so was Sunday racing). It took a voters referendum in 1990 to make both legal. Thank you so much. My Dad was a teller at Liberty Bell ( now Parx), AC, and “the Garden”. He loved it. I went with him whenever I could, Saturday’s or in the Summer when I was out of school. I sat in the Grandstand eating hoagies, and soft pretzels and tasty cakes ! It’s how I taught myself to first read the program, then the “Telegraph” ( Racing Form). I was also intrigued, by the guys hawking the sheets near the entry gates. I miss my Dad and the glory days of racing, the turf at AC and theMatchmaker Stakes are fond memories with Dad. He’d be proud to see a couple home-breds I have race. Always dreamed of getting Dad in a win photo with me so that he might see some of the “ other side” of racing. We did get to Saratoga 2 years including to watch a Travers, to Belmont to see the Belmont ( he cashed some nice tickets that day) and to Churchill for the Breeders Cup and the old handicapper nailed Droselmeyer that day. Dads wa5ch8ng down on me and my family, but we sure had some great memories for many years around racing. I remember the day he walked into the restaurant I was working at while in high school to tell me Garden State burned down that day , but he wanted me to know he got out safe. Thanks for the journey Dad and thank you Linda for rekindling so many great lifetime memories around racing with my Dad.